Get in the drivers seat of your life! Before you master your time, first you must master your mind. And we need to figure out what. Your brain is more powerful than the most complex computer in the world, it’s unconscious daily actions (programs) are keeping you alive. Your heart beating, your blood pumping, your skeleton moving, your lungs breathing. Asleep or awake you are a freak'in miracle. And the amazing news is you have exactly the same things that the people you look up to and admire. Except, they are running different mental programs. If you want what they have, and you can...then you will need to upgrade your operating system. You must be willing to do things that will take you out of your comfort zone, require you to stand out and call upon you to dig deep and find your courageous most badass self. BUT this is where the magic happens, in the discomfort. IF you can push through the BS...you’ll discover the way out of the sinking sand of sameness and the stairs to your greatness. You are one belief away from a totally different life, from everything you hope and dream of having and being. The other secret is that you wouldn't be able to dream these dreams, if you weren't meant to be living them! Because you dream them, and believe them, then they are possible for you. It’s simply a matter of taking the actions necessary to step into that life. Which starts by making friends with your mind. Your mind is not bad, it’s just trying to keep you safe. The the oldest part of your brain (Reptilian). It’s prehistoric and it acts like it. Keeping you in the cave away from the dinosaurs that wanted to eat you. When you learn how to make your mind your friend you’ll never need to force, should, motivate or make yourself do anything ever again. You’ll learn the secret to living with ease and joy, following your intuition from power energy not force based beliefs (more on that in another training). 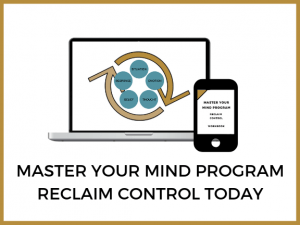 This program gives you a super simple 5-step process to help you become the master your mind and not the slave. Use the 5-Step Process to become the master of your mind. Downloadable workbook to support the online training. Email us with your questions & challenges.